Custom Built Approx 4-6 weeks. 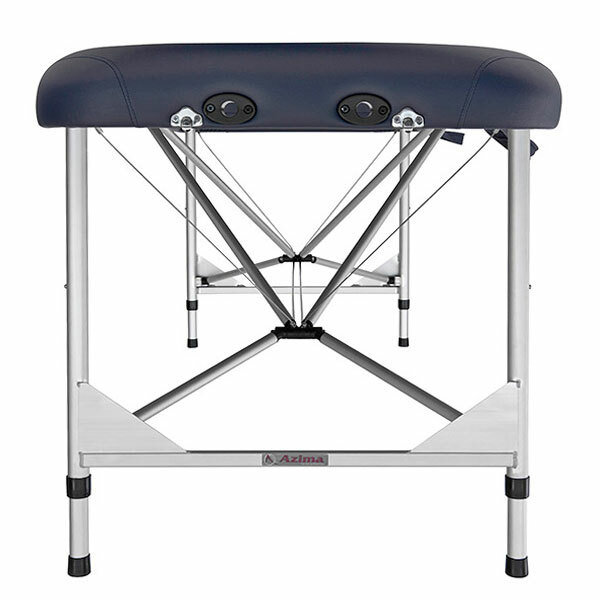 HUNA MAGICA MASSAGE TABLE - designed and built in Australia for Kahuna and Lomi Lomi Therapists. A carefully engineered structure; designed to be safe throughout it's height range. Azima has created a lightweight table of unsurpassed stability and comfort; uphholstered in "Hunathane" the world’s best oil-resistant upholstery fabric over layered triple density foams. Leading Huna teachers have made the Huna Magica their premiere choice. Custom build the table of choice for many Lomi Lomi and KaHuna therapists. Azima has been designing and manufacturing hand-crafted portable tables in Australia for over 30 years. The Huna Magica is a premium lightweight portable built to withstand the rigours and dynamic movements unique to Lomi Lomi and Kahuna treatments. The superior triangulation struts are designed for noise free treatments and unparalleled support on table surfaces as high as 90cm - even under extreme load and years of professional use. The sturdy design helps to optimise your performance while achieving maximum comfort and support for your clients. These are just a few reasons why leading Huna teachers use and recommend the Huna Magica. This product is manufactured to order. Estimated lead-time 4 - 6 weeks. Height and angle adjustable Head Cradle included. High table height range up to 90cm. Unrivalled in its quiet performance even with rigorous lateral loading. Hardwood frame construction with rounded corners. Timber Ply Upgrade @ 6mm $99.00. 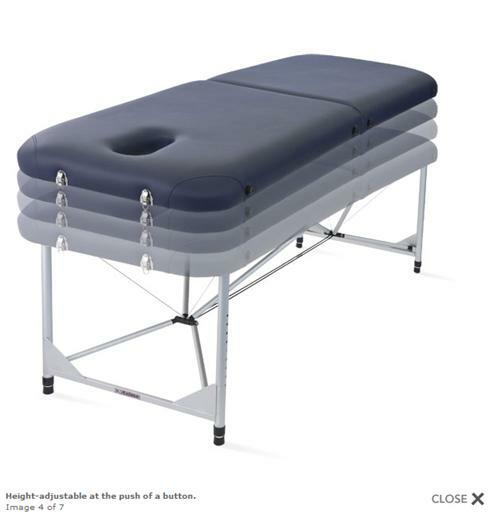 "… have purchased two Azima Huna massage tables and have used both tables extensively for Huna and Swedish massage. At all times both tables have proved able to stand up to the 400 to 500 massages per year, plus various teaching courses over the same period. "I find the quality of the upholstery fabrics used on the tables is the best I have ever used." Kay Prendergast, Hands in Healing, Collie, Western Australia. Instantly adjust your table's height with the push of a button. The Reflex Professional adjusts through 6 height settings from 72cm up to 90cm. Azima's unique, lightweight, all-aluminium frame offers a centrally recessed, open structure providing the ultimate in seated access. All moving joints are nylon sleeved for strength, long life and total silence. Registered Design: IP Australia Manufacturer Warranty Applies AZIMA - PORTABLE TABLE WARRANTY Your Azima portable table is covered by a life-time structural guarantee against defective materials and workmanship. Under this warranty Azima will, at its option, repair or replace defective tables or structural components free of charge, except for any damage caused by accident, misuse or abuse or fair wear-and-tear, subject to the following conditions: •	Plywood guaranteed against structural failure for a period - 5 years •	Upholstery materials are guaranteed to arrive in perfect condition. • Wear and tear, oil damage, chemical damage are expressly excluded from warranty. •	The customer is responsible for any freight costs to return goods in need of warranty to Azima or an Azima service agent. 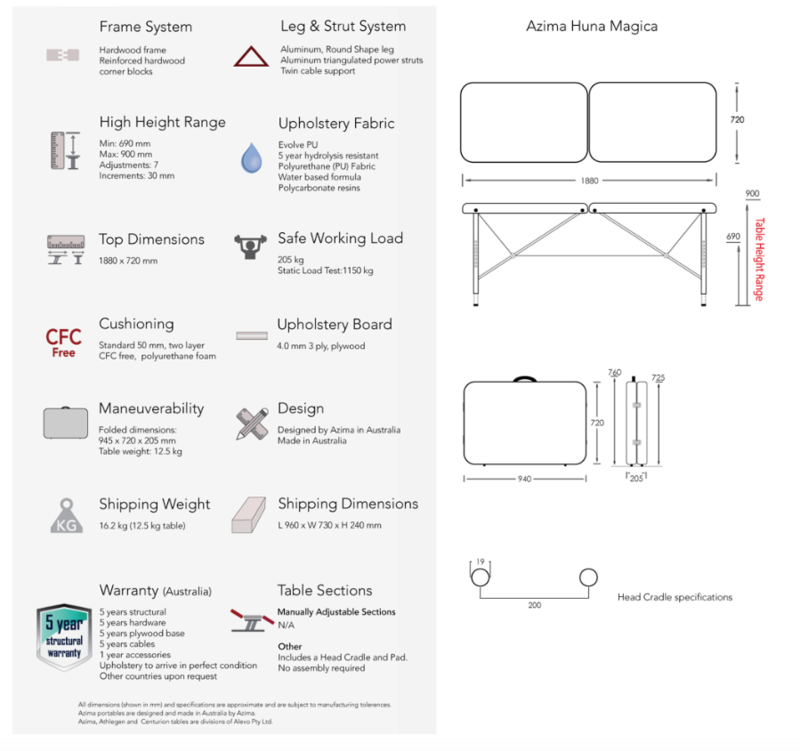 •	The Azima Portable Tables – operating and safety instructions form part of this warranty. The warranty conditional upon use of the product in strict accordance with these instructions.